Next month, America’s National Parks will be celebrating their 100th birthday! With this in mind, we have been doing a post a month from March through August, highlighting five of the national parks we have visited. For July, the fourth National Park being featured on our count down is Hawaii Volcanoes National Park. Getting to this park requires a trip to Hawaii’s Big Island, home of Pele the Hawaiian goddess of fire! We figured there was no better way to take in the gorgeous views than by helicopter tour! However, we almost missed our chance to go on this tour because of the government shut down that closed all national parks. Thankfully, the shut down was lifted the day before our tour! We booked our tour through Blue Hawaiian Helicopter tours and departed from the Waikoloa Heliport. Although there were not major eruptions, we still got to see lava and the beautiful landscape that was formed by the fury of the famous Mauna Loa and Mauna Kea volcanoes. We flew over the “road to no where” which has been destroyed by lava flows on both ends, as well as the water’s edge where the lava has been flowing into the ocean. This is actually increasing the size of the island with as it cools and hardens, making it one of the few places that is getting bigger over time. 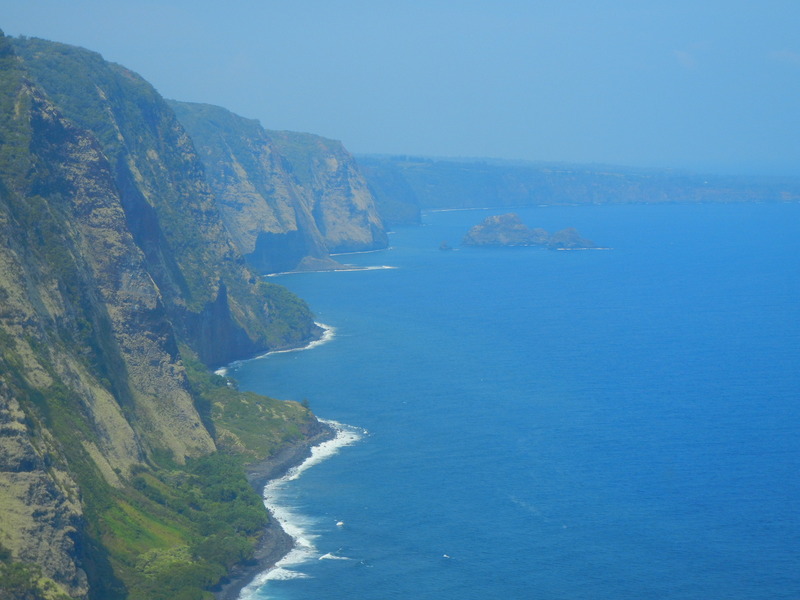 The landscape and coastline is never the same thanks to the volcanoes! Our tour also took us over plantations and the town of Hilo, as well as the towering sea cliffs at the north end of the island. Hawaii Volcanoes National Park is great for hiking, guided tours, and of course helicopter flights. If you want to see and photograph the unspoiled beauty of volcanoes, waterfalls, and lush tropical rainforests, Hawaii Volcanoes National Park is a must for you! What are you waiting for? Summer is a great time to get out and explore America’s National Parks! If you like this post, please feel free to share and please click the follow button to subscribe to my blog and see the rest of our journeys! Very cool! I have been wanting to do a national park hop too! I can’t wait to read about the other ones you have been too. Happy travels! I love our National Parks! Links to the other three featured are at the bottom of this post. Enjoy! Amazing.Such a great experience. Thanks for sharing. Looks amazing. What an awesome way to see it all. It was great to have a bird’s eye view of all that beauty! Absolutely, would have been beautiful. Gorgeous pictures of such a beautiful place. I love taking my family to different National or State Parks. I wish we lived closer to Hawaii because it truly looks amazing. Getting to Hawaii can be a challenge, but it sure made for a unique experience! I have not done the helicopter tour. What a different perspective than hiking through and around the lava flows. Nature is awesome! It would be really cool to hike around the lava flows too! Either way, I don’t think you can go wrong! I have wanted to go to Hawaii forever and I’m crossing my fingers to do the trip for our 10 year wedding anniversary! This looks absolutely amazing! That would be an amazing 10 year anniversary trip! I will keep my fingers crossed that you are able to do it! Amazing! Love the view from the Sky….the photos are amazing and I like how your featuring a countdown of the national parks! Thanks for reading and commenting! I have had fun doing our national parks countdown! Now, I need to get out and visit more national parks! Awe, thank you! The national parks are just so cool! Love them! You’ll have to check out a few if you visit the states! Super cool stuff – still haven’t made it to Hawaii but it’s very high on my list! Hawaii is amazing! We already want to go back! You will love it when you get there! How fun! We’ve often talked about taking the helicopter tour, but never have. Maybe now… Or maybe that’s just another reason to get back to Hawaii! 🙂 Thanks for sharing your experience! Thanks so much for checking out my post! There are so many great reasons to return to Hawaii! Wow! Photos are great. What an amazing way to see it! It was great! I would highly recommend it!